A Comhaltas Branch was in the planning in North Sligo for many years before the ‘Benbulben branch’ was eventually established in 2015. The branch was official launched last weekend in Ellen’s Pub, Maugherow, by former Comhaltas President Vincent Jordan, from Birmingham, England. The Branch is led by Chairperson and All Ireland musician Kerrie Herrity and her father Frank Herity and is now one of eight Sligo Branches of Comhaltas in the County. The evening brought together guests from all over the Comhaltas community including: Former president of Comhaltas Seamus McCormack and his wife Theresa, Sligo county Board Secretary, Martin Enright, Sligo County Board Chairperson and is wife Joyce, PRO Sligo County Board, Peter Farrell, Treasurer Sligo County Board (and also host for the evening), Bernard O’Sullivan, Project Manager, Comhaltas Head Quarters, Dublin and Bartley Gavin, Chairperson Fred Finn branch. Also present Cllr Rosaleen O’Grady whose father is from Maugherow, Cllr Marie Casserley, and Mayor of Sligo, Thomas Healy. Maugherow native Kitty McGuinn, Sligo Association Chairperson, from New York also travelled for the occasion and Jim Carway, of Diverse FM from Luton, UK. Kerrie learned all of her music in Luton before returning to her native Sligo a number of years ago and she always envisaged developing a branch in the North Sligo area. With the return of the Fleadh to Sligo in 2014 and 2015 Kerrie saw the revival in traditional music in her area and set about making plans to develop her branch. Since its founding the branch has established a monthly session which is held every third Sunday of the month in rotating venues across the North Sligo Area but the real home of Benbulben Comhaltas is in Ellen’s Pub which dates back to 1610 and is known the world over, currently ran by Mickey and Mary McLoughlin. The weekend was a brilliant success and a marquee with stage was attached to the rear of the pub which saw crowds of close to 400 people. Many stewards and helpers were on hand to ensure the weekend ran smoothly, the barbeque was fired up, and the tunes and music flowed. Many musicians, singers and dancers from the surrounding area were eager to participate and the audience were treated to a very special performance of, ‘The American Wake Danced by the Feet of Emigrants’, by the Gallagher School of Dancing, Sligo which featured music by Kerrie Herrity and Kenny Donagher from their album, ‘Box and Banjo’. As the night drew to a close the musicians retreated indoors, where not one but four music sessions were held simultaneously. People were heard saying, ‘it’s like being back at the Fleadh’, and everyone enjoyed the energetic vibes and atmosphere. A session followed on the Sunday to draw the weekend to a close. 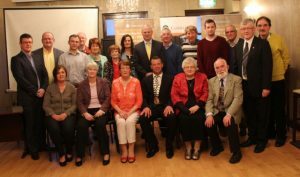 Several people were honoured on the evening for their work in the community in promoting Irish Culture: Thomas Haran, Grange, Brenda O’Callaghan of Cos Cos Dance, Rathcormac, Rosaleen Lang, Brady school of Dance, Grange, Frank Herity, Luton and Maugherow and Mary Gallagher, from the Gallagher School of Dancing, Sligo. Benbulben Comhaltas thanked Ellen’s Pub for hosting their weekend and to all the generous sponsors who helped make the weekend possible. “To all musicians, singers and dancers who performed on the evening and the wider community for coming out and supporting our sessions, the publicans who have hosted the sessions to date we thank you and hope that we can keep the tunes playing for you”, a spokesperson said.